After 40 successful years on Orchard Lake Road, the family owners of Dan’s Subs were ready for a new chapter. They wanted to sell the building—but without the loud display of a “For Sale” sign. Knowing they needed a realtor with an extensive network of local investors and owners, they called the Thomas Duke Company’s Dan Blugerman. And as they expected, Dan knew just the buyer for their building. Joe Takla, owner of Bellacino’s Pizza and Grinders, had approached Dan about other properties in town. So Dan knew what Joe needed and was confident that the sub-shop building would be a good fit for his business. You’ll see how true that is when you visit Bellacino’s in their new home at 22424 Orchard Lake Road. Another Orchard Lake Road business also recently called on Dan for help with a transition. The owners of Farmington Bike Shop tried everything they knew to try, but in the end weren’t able to outcompete big discount retailers selling discount bikes. They asked Dan Blugerman to find a new purpose for their building. With well-designed marketing and his network of connections, Dan brought them five purchase offers. The owners chose Cavin Moon, who will soon be open to provide climbing and safety equipment to adventurers as well as to EMS workers and firefighters. 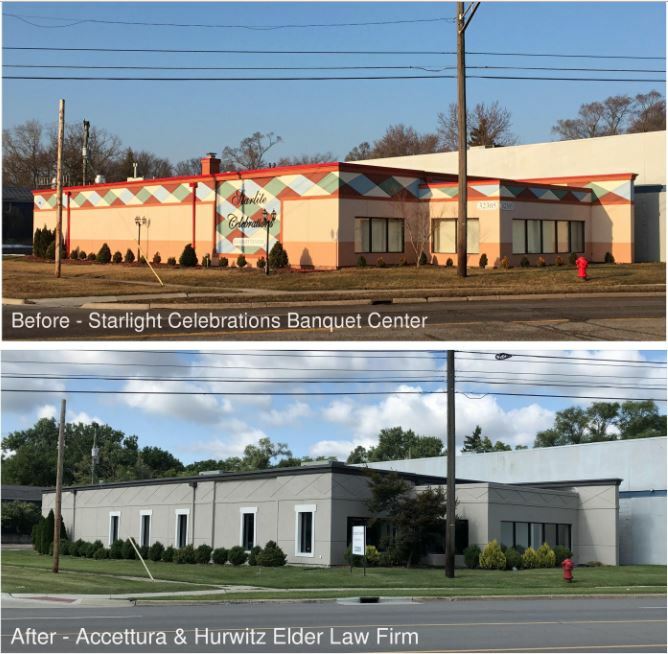 Then, a mile away, the owners of Starlight Celebrations Banquet Center on Grand River at Power Road found that their building’s size wasn’t attracting the large events that would make the business profitable. So they called Dan Blugerman. Once again, Dan’s connections provided a solution. Years before Dan had helped the Accettura & Hurwitz Elder Law firm find a business home. And he’d kept in touch. He helped the firm’s partners recognize that the 5,000 square-foot commercial center could become their dream home. Now, instead of paying rent in a faceless office building, the principals of Accettura & Hurwitz go to work in their own custom-designed, high-profile offices. All these transitions help keep the local economy strong and represent success for everyone invested in the Farmington community. Previous Previous post: A True Story of Value Add and its Rewards Part 3: The Deal.